How do you know you’re having a sales conversation with your Perfect Prospect Profile? Well, first of all, it doesn’t feel like a sales conversation. It probably feels more like a meeting of minds, sharing wisdom, experience, insights, challenges and testing out scenarios. There is a free flow of information. Interesting, challenging questions on both sides. Both parties learn from each other. Both bring huge value to the table, value that is respectfully acknowledged by both sides. How many conversations and sales exchanges have you had that fit this description, say, in the last 6 months? And, why is not every single one of your sales conversations just like this? The reason why you’re probably the same as every single sales person out there, in that you’re not getting the sales exchanges you want often enough, where you and the buyer are really in flow with each other, has little too do with how great you are a building rapport and everything to do with how closely your new business sales and sales lead generation activities focus on recruiting prospects that fit your Perfect Prospect Profile. The cost of not focusing all your sales lead generation efforts on engaging with your Perfect Prospect Profile is huge. And all of this can be avoided. But you have to be laser specific. The more specific you can be, the better. Once you’ve absolute clarity on your Perfect Prospect Profile, then that’s the ONLY prospect you pitch to. Sure you might have three different Perfect Prospect Profile. Perhaps each one serves your Dream Client Profile, your Strategic Client Profile and your Volume Client Profile. Or, maybe your Perfect Prospect Profile has three version depending on your product range. If you know, work to source, and only engage with your Perfect Prospect Profile you’ll make your sales job easier, more simple, and the quality of your sales pipeline will increase dramatically. You’ll be able to do more with less resources – time, money and effort. Your profile as an industry expert will grow, meaning you’ll be the go -to person in your industry. You’ll build an address book of merit. Your value to your prospects will increase hugely. 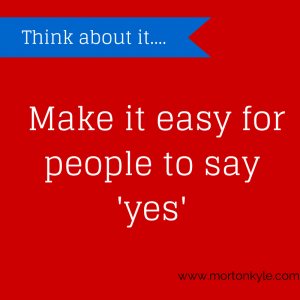 Your prospects will more ready engage with you as your demonstrate your expertise, value and fit with their business. 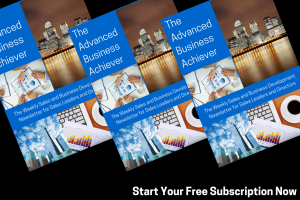 You will be able to hit the sales trifecta of being able to engage, entertain, educate and enlighten your prospects and customers alike. You’re scope to offer additional value to your business as you spot trends, fads and customer wants before your scatter gun competitors makes you a strategic asset to any business. 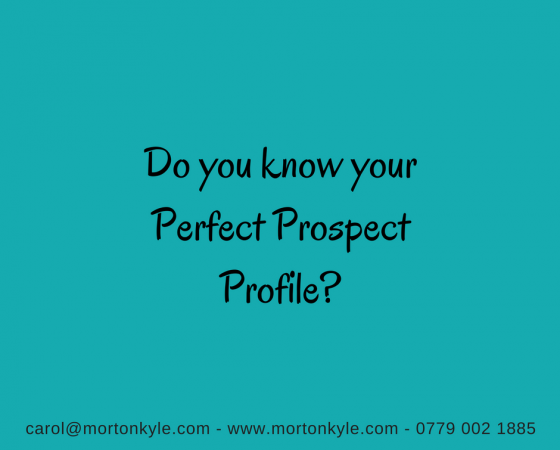 So, next time you feel the urge to chase business that it not in absolute sync with your Perfect Prospect Profile, just remember why you’re working with such a specific customer template.You can get information on How to Identify Your Perfect Sales Prospect by hitting the link. For more help on identifying your Perfect Prospect Profile check out The Sales Improvement Workshop and the Sales Insight study. This entry was posted in Blog, Business Development, Sales Pipeline Management, Sales Training, Selling and tagged B2B Sales Course, B2B Sales Pipeline, B2B Sales Prospecting Training, B2B Sales Qualification, B2B Sales Training, New Business Development Training, Perfect Prospect Profile, Sales Lead Generation. Bookmark the permalink.